India play their 500th Test match at Kanpur against the Kiwis. Could have been just another game but cricket (and its fans) love statistics. So becomes one of the most significant games in India's Test history. To celebrate this milestone, its time to pick up an XI of India's most memorable moments in the Test arena. Disclaimer - The memories are the ones which happened on my watch. 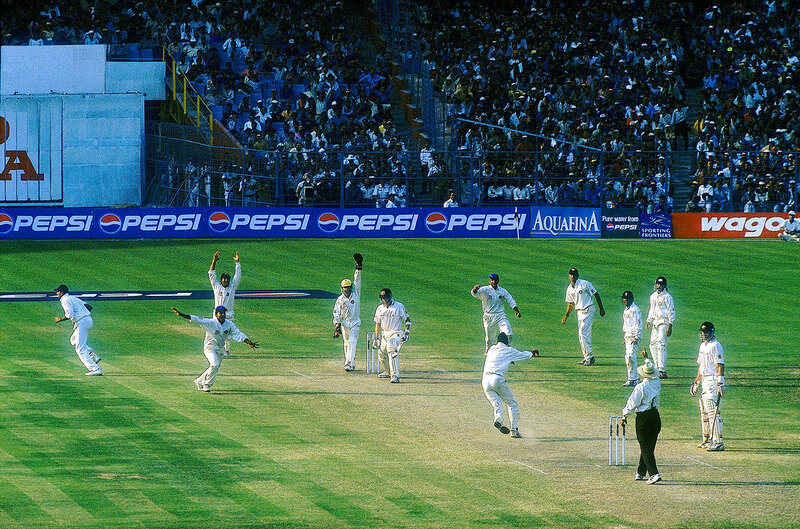 So all are post 1989 or as we cricket tragics mark the event, after Sachin Tendulkar's debut. The greatest turnaround in the history of the game at one of its greatest centers against an all-conquering Australian side who were treating the series as the "Final Frontier". 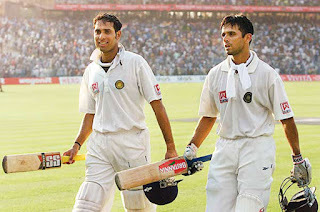 They were well on their way to achieve their goal till they were stopped in their tracks by VVS Laxman and Rahul Dravid. The 4th day's play was not just match or series turning, it permanently instilled a belief in all Indian fans that miracles do happen. By itself it would be remembered as one of our greatest victories. India chased down 387 with Sachin Tendulkar hitting the winning runs after Sehwag had given a turbo-powered start to the chase. But then it wasn't just any other game, being played in the aftermath of the horrific Mumbai attacks. Sometimes sport can provide just that bit of healing touch to a whole nation. 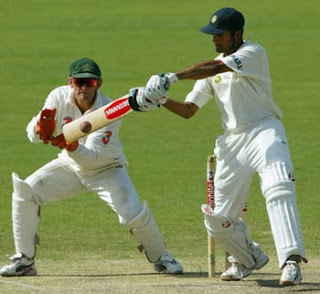 Rahul Dravid hitting the winning runs on the 5th day. An image firmly etched in the memories of the Indian fan. Australia had scored big, but they ran into a pair of familiar foes. The Dravid-VVS combo ensured that both teams are on equal footing after the first innings. And then the much maligned Ajit Agarkar produced his best spell of Test match bowling to knock out the Australians. And he was there at the other end with Dravid to see it through to the end. On a green pitch, India chose to bat first and the English team had the absolute privilege of being the only team to witness centuries from Dravid, Tendulkar and Ganguly in the same innings. And they followed it by slumping to an innings defeat against the spin duo of Kumble & Harbhajan on a green top. A match India lost on the field but where on-field incidents spilled over threatening diplomatic relations. Players were called over for investigations by international judges into racial abuse. There were umpiring controversies galore and accusations of cheating. Questions were raised on the very spirit of the game. The Australians seemed rattled as Anil Kumble declared that "there was only one team playing in the spirit of the game", reminding them of Bodyline time. It was ugly. And after all that the Indians bounced back to win the next one at Perth. Karma. Probably. S. Sreesanth, one of the biggest enigmas of Indian cricket. A freakish talent which went to waste. Amongst his achievements, the one stand-out would be to shut up Andre Nel. And he did it in his own maverick style. Hits a six, runs off to the other end and then starts... dancing!!! Leaving Nel bemused and everyone else rolling in laughter. And he also picked up 8 wickets in the game to win India's first ever Test victory in South Africa. The match had it all. India's first Test victory in Pakistan. Sehwag establishing his legendary status by hitting India's first ever Test triple. And Dravid declaring with Sachin batting at 194. Something which the stat-hungry Indian fan could not get his head around. But all's well that ends well. You need 24 runs to avoid the follow-on. And you have a genuine number 11 for company at the other end. So what do you do? If you are Kapil Dev, you take matters into your own hand and just hammer 4 consecutive sixes. And Hirwani at the other end promptly got out the very next ball. Couldn't prevent a defeat but it was heroic. Personally, me missed out following most of Kapil Dev's glorious career and only remember the dragged out ending in pursuit of Hadlee's Test record. On a pitch which had been dug up a few weeks before, Anil Kumble produced one of those freakish spells of bowling, taking out all 10 Pakistani wickets in the 2nd innings and squaring up the series. And wiping off some of the bad memories of the previous game at Chennai. One of the heart-breaking results for an Indian fan. Sachin Tendulkar nearly pulled off a 4th innings chase all by himself. But the tail could not finish up the job. India were left 12 short off what would have been a sensational victory against arch-rivals Pakistan. For an Indian fan, the 90s were really tough to watch, especially when India was playing abroad. We just couldn't get an overseas test victory (not even in Zimbabwe). So when India got a target of 120 against West Indies, it seemed the elusive overseas victory would be finally achieved. But the pace trio of Ambrose, Bishop and Rose had other plans as India were blown away for 81. That overseas victory would have to wait a few more years. Two full-strength national sides taking on each other in a five day clash played under Test match conditions but not being called a Test match. The aftermath of the Mike Denness affair had led to India lodging a protest. ICC did not withdraw the referee. So India and South Africa got a different referee. ICC removed Test status from the game (but it was still a first class game). This could have been Dravid's captaincy debut. And for poor Connor Willaims, this was his only match for India and could have been his debut. He never payed another international. And the Kanpur Test would have been India's 501st. And the ones which did not make to the list - Irfan Pathan's first over hat-trick against Pakistan, Sehwag's 293 against Sri Lanka, Zaheer Khan's jellybean incident, Kumble bowling with a broken jaw, Dravid's Sabina Park exploits, Harbhajan's 2001 series. And many, many more. Hopefully many more will come in over the coming years.